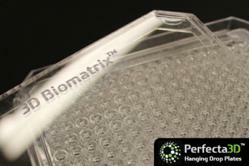 3D Biomatrix, which develops and markets three-dimensional cell culture products, has cooperated with Eppendorf, a leading global manufacturer of laboratory instruments for life science, to develop downloadable definition files for forming liquid hanging drops in 3D Biomatrix’s Perfecta3D[TM] Hanging Drop Plates. Protocols are available at 3DBiomatrix.com. For users of the epMotion systems, these protocols will allow for high throughput cell culture automation and spheroid formation in the Hanging Drop Plates. 3D Biomatrix, a leader in the development of three-dimensional (3D) cell culture products, has collaborated with Eppendorf to produce definition files for automated dispensing of media into 3D Biomatrix’s Perfecta3D[TM] Hanging Drop Plates. For users of the epMotion systems, these protocols will allow for high throughput cell culture automation and spheroid formation in the Hanging Drop Plates. The Perfecta3D Hanging Drop Plate is a versatile 3D cell culture plate designed to simplify and streamline spheroid formation, culture, and subsequent testing of the 3D cell cultures. Spheroid cultures grown in Perfecta3D Hanging Drop Plates allow drug discovery researchers to easily mimic tissue metabolic and proliferative gradients, to capture complex cell-matrix and cell-cell interactions, and to monitor cell growth easily and regularly. They are the only 384-well high throughput tools for mass production of true 3D spheroids. The Eppendorf epMotion is a liquid handling system commonly used in pharmaceutical and academic laboratories performing cell culture and cell based assays. The use of the Perfecta3D Hanging Drop Plates with liquid handling systems will allow for these laboratories to easily screen potential drugs in 3D cell cultures. The definition files for the Eppendorf systems can be downloaded directly from the 3D Biomatrix website under the protocol section. 3D Biomatrix also has protocols for use with the Beckman Coulter Biomek FX system and will continue to make available protocols from additional liquid handling systems in the future.